. 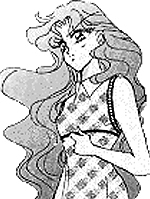 : Lunar Palace v.5 - Manga: Sailor Neptune :. She always watches Haruka's back. If Haruka is the light, then Michiru is her shadow; they are a contrasting pair.